One of the most vital features of laptops today, one that is among the most important for PC shoppers is battery life. How long a laptop lasts on its internal battery has always been an important consideration for travelers, students, and gamers alike. Users are held at the mercy of their computer’s juice and often have to stay close to an AC power source while working, in conference rooms or on planes because of this. Generally, depending on a poor-battery-life laptop when you’re far from a power source isn’t a good experience. Especially, if you have an upcoming long flight, conference meeting or final-exam where the AC power sources are few and far between. In light of this, manufacturers are making good strides to make better battery technology and for some, it seems to be working. Admittedly, some gaming laptops have benefited from such technology and offer longer life, notably longer than the 3 hours that was the norm in recent past. Recent improvements on the 8th Generation processor have also brought forth better performance for laptops. Some of the longest lasting models offering up to 14 hours are powered by these processors (Intel Core i9-8950K, Intel Core i7-8650U, Intel Core i7-8550U, Intel Core i5-8250U). For instance, the HP EliteBook x360 1030 G3, Lenovo Yoga C390, Lenovo ThinkPad X1 Carbon (2018) and Microsoft Surface Book 2. Interestingly, MSI used the same 8th Gen processor for the MSI GV62 8RD-200 laptop. However, while this new mobile chip delivers significantly better performance and power-efficiency, the MSI GV62 8RD-200 battery life is still poor. The laptop offers 2 hours especially when gaming but with conservative use managed close to 4 hours. That goes to say that changing computer habits adds a few more minutes or even hours to your battery life. It’s like cycling slowly and conservatively up a hill to save on energy. Close competition like the Acer Predator Helios 300 (6 hours), HP Pavilion Power 15t (6 hours 59 min), and the Lenovo Legion Y720 (6 hours 16 min) offer better battery life. We’ve done a comparison chart to show which other options available. Among the listed laptops, the Dell Inspiron 15 7567 shows more promise with an 11-hour battery and budget price. 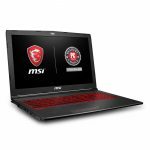 All in all, while the MSI GV62 8RD 200 laptop is without a doubt an attractive gaming laptop with aggressive pricing and performance, it suffers for its poor battery life. The lackluster performance in battery life definitely robs it of the glory it deserves. As a result, we recommend the Dell Inspiron 15 7567 desktop which sells for just about the same price and offers almost similar performance. Additionally, for users with a bit more change in their pockets, the Acer Predator, HP Pavilion and Lenovo Legion Y720 are all good substitutes. They offer better colorful displays, Harmony speakers (Acer Predator Helios 300) and of course longer battery life. Read the MSI GV62 8RD-200 laptop review for a complete in-depth analysis.